In small bowl combine chipotles, 1 tablespoon adobo sauce and mayonnaise; set aside in refrigerator. 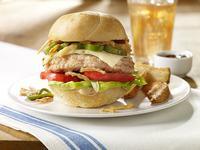 Prepare Turkey burgers, heating to 165 degrees internal temp as measured by meat thermometer. Spread mayonaise mixture on both cut sides of buns. Top bottom halves of buns with lettuce, tomato, burger, cheese, sauce and fried onions.